German CGI design firm Viaframe imagined these sets of armature for a body's fleshy inner parts. A solid casement for your heart, lungs, or brain. They're an interesting thought-experiment around what's happening, research-wise, at the cellular and molecular level. How do you protect an organ system? What makes it robust and thriving, instead of susceptible to disease? And what relationships, if any, are there between these kinds of speculations and the current models for replacement limbs that do exist? Perhaps it's utter fantasy, but these caught my eye as a thinking-through-images. More, including some making-of shots, at Viaframe. Thanks to Brad Johnson. 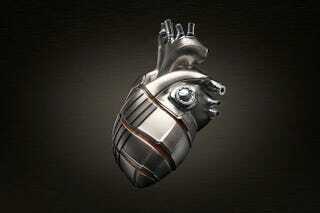 Images: In each, the human heart, set of lungs, and brain are encased in sleek metal armor, somewhere between jewelry and mechanical parts for machinery. They conform to the shapes of the organs precisely, showing their enigmatic structures, isolating their particular functions.